Sugar is a tough subject to tackle. Sugar is tied to peoples’ emotions, traditions and is, well, highly addictive. When you start talking about reducing it, people can get hysterical. So today I’m going to share my own personal thoughts on sugar and what I know from experimentation and research of my own. A few of you on Twitter/Instagram asked a few questions pertaining to sugar so I’ll also be covering those if I didn’t already address it! Only the power of the sugar lobby in Washington can explain the fact that the official U.S. recommendation for the maximum permissible level of sugars in the diet is an eye-popping 25 percent of daily calories. To give you some idea just how permissive that is, the World Health Organization recommends that no more than 10 percent of daily calories come from added sugars, a benchmark that the U.S. sugar lobby has worked furiously to dismantle. In 2004 it enlisted the Bush State Department in a campaign to get the recommendation changed and has threatened to lobby Congress to cut WHO funding unless the organization recants. Dang. So feel free to chew on that. Sucrose (sucrose is the organic compound commonly known as table sugar) has its place in Washington. Fighting the good fight? Sugar makes a lot of money and sugar isn’t going anywhere. Sugar is a really general term. Within sugar, you have glucose, fructose, sucrose, lactose and more. The average American adult consumes 22 teaspoons of sugar a day. The average American child consumes 32 teaspoons a day. 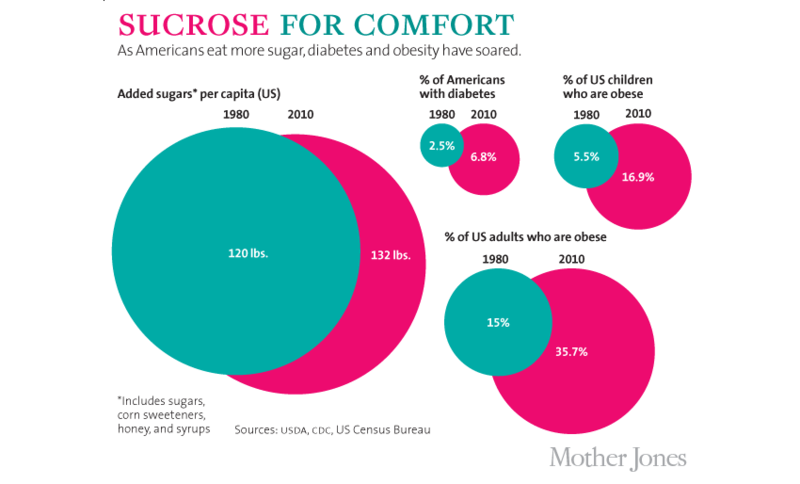 How are we consuming all this sugar? Soft drinks, fruit, candy, baked goods, fruit drinks, dairy and grains. Yep, I’m not just talking refined granulated sugar added directly to your coffee. It’s in everything. Now here’s the gist of the matter: every molecule we stick in our gobs has corresponding appetite hormones. And when we’ve eaten enough of said molecule, these hormones tell our brains, “OK kiddo, we’re full now. Stop eating.” Our bodies are good that way; we’re designed to eat only as much as we need. Every molecule, that is, except fructose. Like I state below in the Q&A, But don’t be fooled into thinking fructose on a label means you are eating fruit sugar. Pure crystalline fructose comes from two sources: corn or sucrose (table sugar). High fructose corn syrup is in SO MUCH of what we eat. *Please note that since I’m focusing on fructose in this post, you should know that the glycemic index (which is a very helpful tool) focuses on glucose. Glucose is the simple sugar made by the body through digestion of carbohydrates. So now that we’ve established that sugar is powerful and we’re eating a lot of it…we can get into the scary stuff. Here’s the thing, I’m not going to bore you with scientific studies/research/facts. I’m going to brain dump and let you know what I’ve learned about sugar + our bodies. Sugar (especially when you drink it) converts to fat. That’s what sugar was probably made for. When we lived more caveman-like, we ate sugar before winter came. We gained weight and stayed warm. We ate the sugar that was naturally available to us. Since I live in Ohio, I wouldn’t be eating oranges all year if it weren’t for trains, planes and automobiles. But we live in a modern world and now we drink Red Bulls, eat exotic fruit, pig out on bread and drink sweet cocktails like there’s no tomorrow. Yeah, that’s going to make you fat. Or bloated. Fuzzy in the brain. Crash. Then the long term? Obesity. Diabetes. Acne. Depression. Anxiety. Headaches. High Blood Pressure. Nervous Tension. Suppresses your immune system. Feeds cells (and in turn, cancer cells). I’m sure the list could go on and on. Since fructose goes undetected in our system, we can eat A LOT of it. I learned that while doing Sarah’s I Quit Sugar program. She related it to drinking 32-ounces of soda. You probably would get full if that was yogurt! It makes us crave more. It’s an ugly cycle. Glucose: Glucose is the simple sugar made by the body through digestion of carbohydrates. It is the body’s chief source of energy. Sometimes glucose is called dextrose. Sucrose: Sucrose is what we commonly refer to as table sugar. It is made from highly processed sugar cane or sugar beets. The composition of sucrose is a combination of glucose and fructose, which separates during digestion. Pure sucrose is devoid of any nutrients. Fructose: Fructose, commonly called fruit sugar, is a simple sugar found in honey, tree fruits, berries, and melons. But don’t be fooled into thinking fructose on a label means you are eating fruit sugar. Pure crystalline fructose comes from two sources: corn or sucrose (table sugar). Corn starch is processed to release fructose. Sucrose (table sugar) is enzymatically hydrolyzed to separate into glucose and fructose. Crystalline fructose is pure fructose from one of these two sources. Lactose: Lactose is the naturally occurring sugar found in milk. A molecule of lactose is formed by the combination of a molecule of galactose with a molecule of glucose. It is broken down when consumed into its constituent parts by the enzyme lactase during digestion. Children have this enzyme but some adults no longer form it and they are unable to digest lactose. What is the difference in how the body processes natural sugars vs processed sugars? There’s really no difference. Sugar is sugar. Since we’re avoiding fructose – we should be avoiding excessive amounts of sugary fruits (apples, mangos, bananas) but also high fructose corn syrup (at all costs). Agave is often advertised as lower on the glycemic index but is 90% fructose. Studies also show that our bodies still register “fake sugar” (like aspartame) as sugar. There’s really no way around it. We need to limit it all. How long it takes to detox from it? The programs that I see are usually 2-6 weeks for detox and withdrawal. I cut sugar back in autumn 2012 and really struggled at first. I felt better after 2 weeks of no sugar but I’m not sure about the actual amount of time. What are safe sweeteners? Stevia! Stevia isn’t sugar but comes from the stevia leaf. Beware of white, bleached versions though! Have access to sunlight? It’s best to grow your own leaves, dry and crush into your own powder. Also, the liquid forms tend to be alright too. How bad is high fructose corn system for you really? Pretty bad. The process of creating high fructose corn syrup is not only extremely complicated, it’s also kept under wraps. The FDA does not regulate contaminates like mercury in HFCS. This stuff is used because it’s cheap and we’re consuming way too much. It’s in salad dressings, condiments, soda and much more. Honestly, if you want to know more I would highly encourage you to pick up a copy of Sarah Wilson’s I Quit Sugar challenge. In it she outlines how to identify where sugar is in food products and shares her guide to quitting sugar. She doesn’t demonize fruit (although she challenges you to limit your fruit intake) and makes it really fun by providing awesome recipes. If you’d like to know more about sugar – comment below with your thoughts, arguments or questions! Perhaps sugar will get a second post here on Considering You. Thanks for always sharing so much great information! I recently found your blog through the Influence Network and just love it! Can you explain more about what exactly Stevia is and why it is considered to be the best alternative. It seems like there is always some new thing that pops up and is the answer to our sugar woes but then down the line turns out to be not so fabulous for us. I’m thinking of course of aspartame and other artificial sweeteners but also now you’re saying agave and honey, which are usually considered ‘good’ or ‘healthy’ alternatives to sugar, also aren’t the best options. I guess I’m just wanting to know more about what stevia is and why you recommend it. That’s a great question! Since it has a glycemic index of ZERO, that means people who need to watch their sugar intake can digest it without harm. Because stevia has a negligible effect on blood glucose, it is attractive as a natural sweetener. Since it’s not made up of glucose/fructose/sucrose, it’s not really sugar. Like the illustration above, honey is 40% fructose but agave is 90% fructose. When it comes to the glycemic index, agave is actually considered “better” since it’s made up LESS of glucose. It’s this constant balancing act. While in this post, I’m showing you how to avoid fructose…you also don’t want to binge on glucose (carbs).